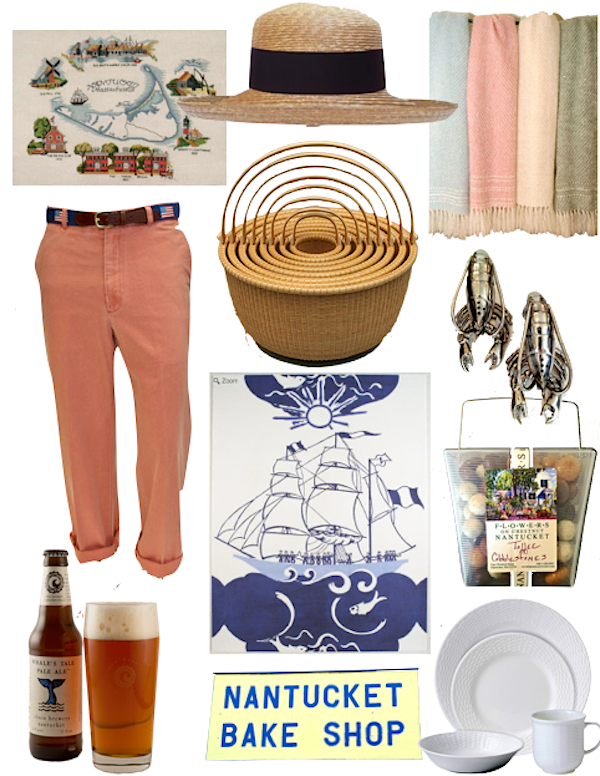 I’m sure many of you guessed that this week’s At Ease post would be Nantucket based. Not only is the island blessed with natural beauty but the selection of stores provides a plethora of both traditional Nantucket favorites as well as new additions to the island’s popular shopping scene. It would take me more than one At Ease to cover all that Nantucket has to offer but this week, I’ve included just a few classics to give you the flavor of what is available. Erica Wilson was a Nantucket legend and her eponymous store carries on the tradition including the needlepoints that she was famous for. This cross stitch Nantucket map kit, with its island landmarks, is a classic. Almost everyone I know on Nantucket owns a hat from Peter Beaton. Owner Darcy Creech’s charming shop is an island staple and, like all her signature collection, this Coatue hat is made from finely braided leghorn straw and comes in the famous striped hatbox. Nantucket Looms is a must visit. They carry the works of many island artists and craftspeople and their beautiful hand loomed throws, like the mohair ones pictured above, are coveted gifts and wedding presents. Owned by NJ designer, J Butler Haines, seasonal shop J. Butler is a wonderful home furnishings shop that always has fun finds like these lobster salt and peppers (call (508) 228-8429 for more info). These toffee cobblestones from the irresistible Flowers on Chestnut are one of my favorite hostess gifts. Equally clever and delicious, they are a reminder of Nantucket’s bumpy thoroughfares. The much-missed Weeds was a former favorite home accessories store on island. The timeless classic Wedgwood Nantucket basket pattern was the brainchild of shop owner George Davis. The Nantucket Bake Shop is a dangerous, almost daily stop for me. An island institution, their Portuguese bread, Boston creme pie and shortbread are family favorites. I can’t even keep the butter crunch cookies in the house for fear of eating the entire bag in one sitting! Cisco Brewers is a winery, brewery and distillery in one, in this ever-evolving young company. Their location has become a destination not only for their products but for tours (with shuttle buses from downtown), music and revolving events. Whale’s Tale Pale Ale is not only tasty but has great island themed packaging. Murray’s Toggery is the home of the famous Nantucket reds and a Main Street fixture for over half a century. Guaranteed to fade, this signature canvas can be seen in a variety of styles but it’s the men’s pants and shorts that started it all. Four Winds Craft Guild is the go-to in-town spot for authentic new and antique Nantucket lightship baskets, scrimshaw and traditional local crafts. These nested baskets are one of the most popular and enduring shop items of functional art. Trillium is a treasure trove of fine home furnishings and accessories. In one of the most charming shops, they offer a creative cache of tempting wares. Each summer they feature select original art by Parisian designer Paule Marrot and I was totally enchanted earlier in the week by this large nautical themed print, which would provide a whimsical graphic punch to any room. This entry posted in art, At Ease, fashion, food and drink, gifts, travel. Entry Tags: At Ease, Nantucket, Travel Bookmark the permalink. I think you captured the places I love to wander in ACK on rainy days! Decade after decade some remain true and are just as fun as ever! Hi, I found your blog on Pinterest. Thank you so much for your post! I will be visiting Nantucket for the first time over Labor Day weekend and was curious if you have any dining recommendations as well. I would really appreciate it!